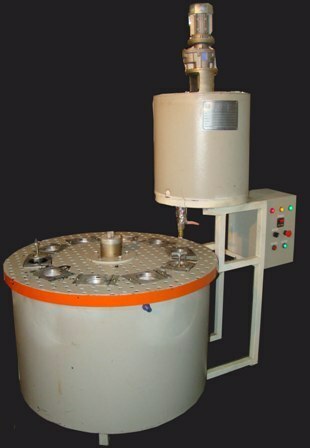 The “Sprue Caster” is designed for gravity casting of single sprues with metallic inserts. The sprues are formed with the pouring cup. Handles are later assembled to the cast wax sprue. The machine is simple to operate and is designed for high productivity. Standard supply includes dies for 30X30X350mm sized sprues with full length Aluminium inserts.Custom sprue designs on request. Laxminarayan technologies is today a premier Investment Casting Machinery manufacturing company specializing in turn-key investment casting foundry projects with medium to high level automation. We are the leaders in manufacturing world class machinery, chemicals and consumables and have been developing new products for the investment casting industry since 1986. Our project services include complete plant design, suitable machinery, manufacturing technology, onsite training. Machinery include hydraulic wax injectors, dewax autoclaves, slurry mixers, fluidised beds, sand rainers, knockout machines, pre-heating furnace and Abrasive cut-off machines.